We’d love your help. Let us know what’s wrong with this preview of Il giardiniere curioso by Guy Barter. 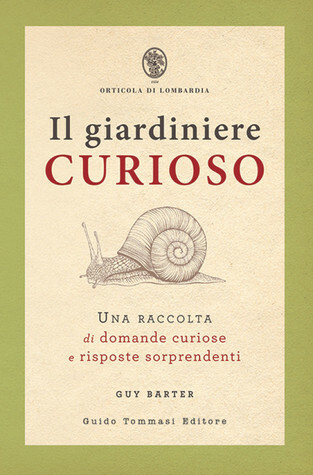 To ask other readers questions about Il giardiniere curioso, please sign up. This book is designed to be dipped in to. Say I will not be surprised if in a year or so time it will not appear again on my reading list. Now basically it has taken a number of questions about the natural world and more specifically the plants and gardens we so recognise. Not surprising considering its published by the Royal Horticultural Society - as I am sure these questions in some form or other have crossed their doors. So what we have here are a series of questions - now each answer is spr This book is designed to be dipped in to. Say I will not be surprised if in a year or so time it will not appear again on my reading list. The book is so easy to read and very additive as you just want to read one more answer. The only criticism I would have is that would it have hurt to give some answers a little longer explanations (or were they limited as if this book has reused articles from another publication). • Why do flowers close at night? • Does a severed worm grow into two worms? • What is the difference between a fruit and a vegetable? • Why is compost hot? • When is a plant a weed? And so much more knowledge crammed into this easy read book. •	Why do flowers close at night? •	Does a severed worm grow into two worms? •	What is the difference between a fruit and a vegetable? •	Why is compost hot? •	When is a plant a weed? I hate to be the first one to mention this (and most likely I am not) but that major gift giving time of the year is fast approaching: Christmas. This is an ideal book to add to your gift buying list, there is something in these pages for everyone. Ein wirklicher sehr schönes Buch über verschiedene Aspekte des Gartens, im Grunde eine Art Was-ist-Was? für Interessierte aller Altersstufen. Setzt mehr auf einen lockeren oder spannenden Zugang als auf "tiefe" Erklärung. Geeignet um Durchlesen, habe ich gemacht, und zum Wiederreinblättern, wird sicher noch folgen. Kleiner Wermutstropfen, der es zu einem 3,5 Sterne-Buch macht: Meine deutsche Übersetzung ist stellenweise nicht gut und schlecht lektoriert. Das fällt gerade bei dieser absichtlich kn Ein wirklicher sehr schönes Buch über verschiedene Aspekte des Gartens, im Grunde eine Art Was-ist-Was? für Interessierte aller Altersstufen. Setzt mehr auf einen lockeren oder spannenden Zugang als auf "tiefe" Erklärung. Kleiner Wermutstropfen, der es zu einem 3,5 Sterne-Buch macht: Meine deutsche Übersetzung ist stellenweise nicht gut und schlecht lektoriert. Das fällt gerade bei dieser absichtlich knackig-kurzen Form der Wissensvermittlung deutlich auf. Interesting, some technical information but it's all useful. Lot's of helpful information in short bites. Beautiful illustrations. I really like how old fashioned the design of this book feels. A great book to go back to again and again.